Prophetische Ermutigung bei Listening2Jesus.org - Wie ist das möglich? Bitte das Cache-Verzeichnis beschreibbar machen. What do You Think About the Motives of People's Hearts? Many of the recent discoveries in science confirm theories from Albert Einstein, which indicate that space, time, and matter did not always exist but came into existence at the same event. This event is commonly called the Big Bang. The existence and the precision of the expansion of our universe point to an intelligent being or person who deliberately planned and caused the Big Bang. I would love to explain the foundations of these statements in detail, but I cannot do si right now since I would like to make a different point. One great resource for learning more about these is www.crossexamined.org, if you are interested. If time has a beginning and if there is a person who create time, space, and matter, it means this person must exist outside of time, space, and matter. Otherwise the person would not be able to create those things, but could only transform or reshape them. I believe the person we are talking about is God. He is a person who created the universe out of love, because he is love. What scientists are discovering nowadays has been shared throughout the centuries by Jews and Christians who believe the Bible is true and consists of a direct message from God to us. We are living in exiting times! Therefore when the Lord knew that the Pharisees had heard that Jesus was making and baptizing more disciples than John (although Jesus Himself was not baptizing, but His disciples were), He left Judea and went away again into Galilee. Why was the One who would baptize with the Holy Spirit and with fire not baptizing? Jesus: "How are you doing this morning, Holy Spirit?" "I am doing awesome, the love of the Father is just flowing freely from heaven, today." "Yes, I know, I am enjoying it, too. 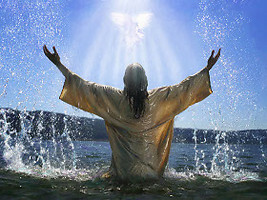 This will be another good day to baptize more wonderful people and help them enter into our kingdom." "Jesus, how about if join the disciples in baptizing the people, today?" Hinter Listening2Jesus.org steht eine Gruppe von Menschen, die einfach Freude daran haben, sich mit Gott zu unterhalten. Weil uns das so viel Spaß bringt, möchten wir Dich und Deine Freunde einladen, bei diesem Abenteuer mitzumachen. Ein Mißverständnis mit unserem Internetanbieter führte Ende September leider zur Löschung der Inhalte unserer Website. Falls Du unser Team in den letzten Monaten um ein Wort der Ermutigung gebeten hast, möchten wir Dich einladen, Deine Anfrage einfach unter "Wort der Ermutigung" erneut zu stellen.